The U.S. Army is fast-tracking newly configured Stryker armored vehicles with helicopter and drone-killing weapons to counter Russia in Europe and provide more support to brigade combat teams. “We are looking for a rapid solution for the near-term fight,” Maj. Gen. John Ferarri told Warrior Maven in an interview. The Strykers will fire a wide range of weapons to destroy close-in air threats attacking ground units, to potentially include Hellfire or Stinger missiles. The program, which plans to deploy its first vehicles to Europe by 2020, is part of an Army effort called Short-Range Air Defense or SHORAD. Given that counterinsurgency tactics have taken center stage during the last 15 years of ground wars in Iraq and Afghanistan, the Army now recognizes a need to better protect soldiers against more advanced, near-peer type enemy threats — such as drones, helicopters or low-flying aircraft. “We are looking for an end to end system that is able to detect and defeat the rotary wing fixed wing and UAS threat to the maneuvering BCT [brigade combat team],” Col. Charles Worshim, a U.S. Army project manager, told Warrior Maven. Worshim said the Army has sent a solicitation to a group of more than 500 weapons developers, looking for missiles, guns and other weapons like a 30-millimeter cannon able to integrate onto a Stryker vehicle. Although drone threats have been escalating around the globe, U.S. foes such as the Taliban or Islamic State have not presented aerial threats such as helicopters, aircraft or large amounts of drones. However, there is widespread recognition that the service must be better equipped to face technically sophisticated enemies. As part of its emerging fleet of SHORAD Stryker vehicles, the Army is exploring four different weapons areas to connect with on-board sensor and fire control, Worshim said. They include Hellfire missiles, Stinger missiles, guns and 30-millimeter cannons. Also, it goes without saying that any kind of major enemy ground assault is likely to include long-range fire, massive air support as well as closer-in helicopters and drones to support an advancing mechanized attack. This is where the Stryker SHORAD comes in. Infantry does not have the same fires or ground mobility as an armored Stryker, and handheld anti-aircraft weapons such as a hand-fired Stinger would not have the same defensive impact as a Hellfire- or Stinger-armed Stryker. In a large mechanized engagement, advancing infantry needs fortified armored support able to cross bridges and maneuver alongside foot soldiers. Chinese or Russian helicopters and drones are armed with rockets, missiles and light weapons. A concept with SHORAD would be to engage and hit these kinds of threats prior to or alongside any enemy attack. Patriot missiles are better suited to hit incoming mid-range ballistic missiles and other attacking threats. While mobile, a Patriot is less able to support infantry. 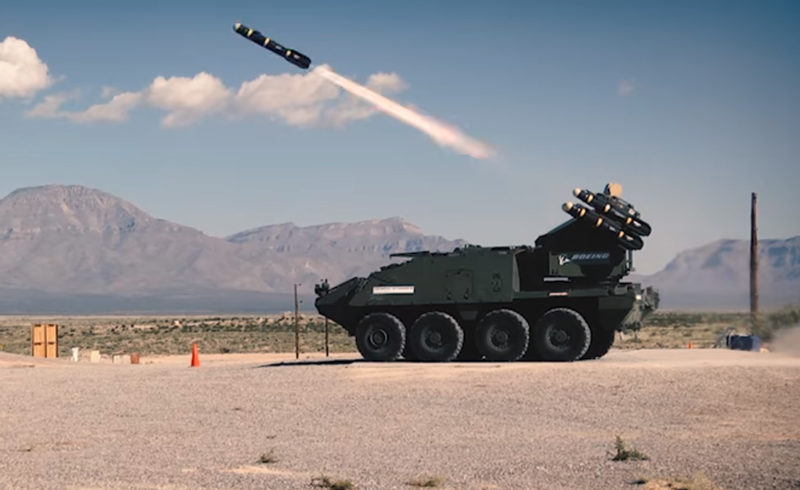 The Army is also developing a truck-mounted launcher designed to destroy drones and cruise missiles on the move in combat. The launcher has already successfully fired Hellfire, AIM-9X Sidewinder missiles and other weapons as a mobile air-defense weapon. It is showing great promise in testing, fires multiple missiles, and brings something previous not there to Army forces. The SHORAD effort has been under rapid development by the Army for several years now. In 2017, the service held a SHORAD “live-fire shooting demo” at White Sands Missile Range, New Mexico. Some of the systems included in the demonstration included Israel’s well-known Iron Dome air defense system, a Korean-build Hanwha Defense Systems armored vehicle air defense weapon, and a General Dynamics Stryker SHORAD launcher. U.S. military officials familiar with the demonstration said the Hanwha platform used was a South Korean K30 Biho, called the Flying Tiger. It is a 30-millimeter self-propelled anti-aircraft weapon which combines an electro-optically guided cannon with surveillance radar on a K200 chassis. One of the Strykers used was an infantry carrier armed with an Orbital ATK 30-millimeter cannon. This weapon can be fired from within the Stryker using a remotely-operated weapons station. An industry source familiar with the demonstration said Iron Dome hit its air targets but elected not to fire at surface targets, the Flying Tiger completely missed its targets, the Orbital ATK integrated gun failed to engage targets and SHORAD hit all three targets out of three attempts. At the same time, building similarly-armed Bradleys or infantry carriers is by no means impossible. “There could be an air and missile defense mission equipment package integrated onto other combat vehicles,” Worshim said. This article originally appeared at Warrior Maven.